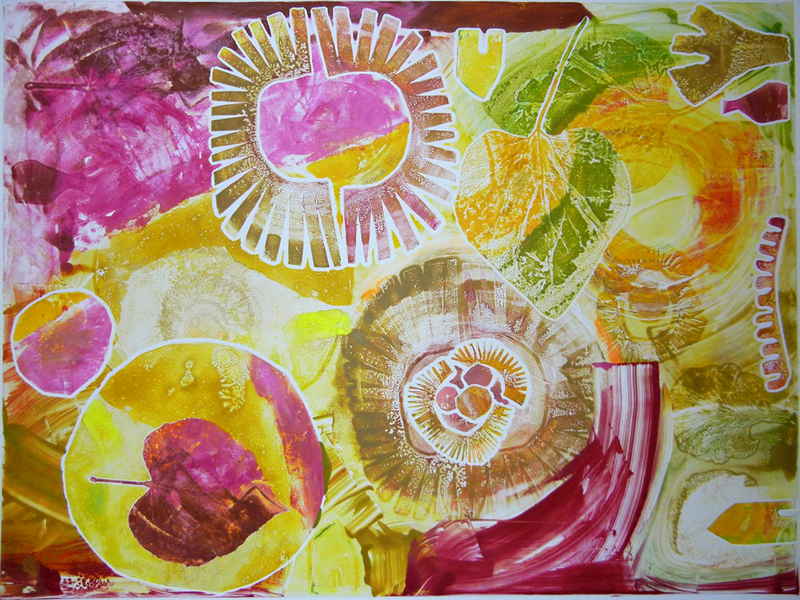 Recent monotype entitled ‘house in the woods’. Fall in New England is at it’s peak and the colors this year have been outstanding. Years ago I loved to drive the back roads of Vermont and witness the pastoral beauty of the autumn landscapes. Now I’m just as content to find nature changing in little micro-landscapes that pop up everywhere in between the pavement and telephone poles. It’s encouraging to see well tended, tiny pocket gardens and or an occasional reckless vine that positions itself just perfectly along a tree trunk and make a striking statement visually. At this point I’m not sure if my deck is starting to look like my artwork or perhaps it’s the inspiration for it. It was so monochromatically green all summer and now each leave is rebelling in there own way. Gardens have been the inspiration for many artists and one of my personal favorites is Paul Klee. Recently I took the MBTA to Boston College McMullen Museum to see the Paul Klee Philosophical Vision: From Nature to Art. It’s worth the trip to see so many of Klee’s piece’s in one exhibit. It ranges from sketches to painting and reveals his process for creativity. It must have been so difficult for Paul Klee to be a Jew in Germany during the early 1930s. Recently I read In the Garden of Beasts by Erik Larson that focuses on the rise of Hitler as it unfolded. The book is the true story about an American diplomat and his family living in Berlin starting in 1933 and really gives insight into what it was like during this tumultuous period in history. Like all of Larson’s books I was unable to put it down… There are sketches in the exhibit that Klee created during this very troublesome time in his life and the book enabled me to understand his circumstances a bit more clearly. Hi Donna. You do wonderful work and it’s not surprising that you are drawn to Paul Klee’s art, as I am. I have seen the show at BC several times and I even attended much of the attendant Philosophical Conference on Klee that occurred last week. Very heady stuff. It’s a small thing and it’s surely water over the dam, but it isn’t very clear whether Klee was actually Jewish. What seems to be clear is that his immediate family history shows a greater identification with it’s countries of origin than a specific culture or religion (from my very limited web searching). In the 30’s when he was working in Dusseldorf, the Nazis required all state employees to prove their Aryan ancestry in order to keep their teaching posts. Klee demurred because he felt it was wrong on humanitarian grounds and eventually refused altogether because of a crucial additional requirement: that employees also declare allegiance to the Nazi party. He refused, quit teaching and moved back to Bern. Wow-you’re an expert-thanks for explaining the details. Klee is a fascinating artist. The deeper I try to understand what his motivations were, the more “protective” I feel about his “universe”. He seems to transcend the usual categories. Donna, Love this print. Unfortunately, I didn’t make it to the James Library opening but will try and visit the show. Great post below. I like the reading recs as well as the art. We had a very successful opening last Friday. You’ll have to stop by and see the new show- Emmaline Payette- a young artist from Dedham. 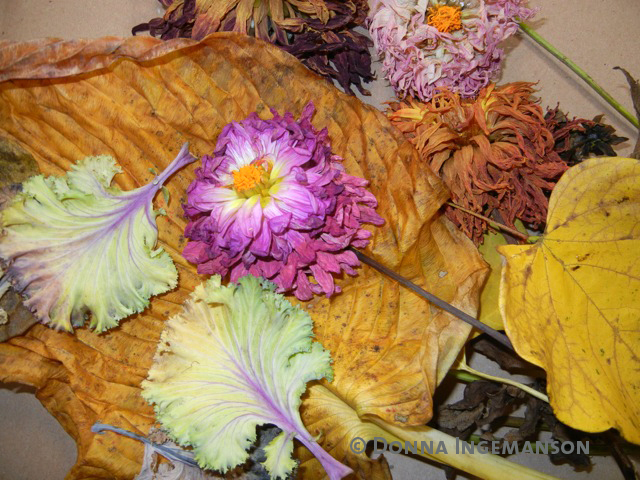 Happy Fall, Karen K.
Karen-Thanks for all your kind words and support. My prints will be at the James Library until October 30th-yikes that’s not much time.. I’ll definitely stop in to see the newest exhibit at the Thayer Gallery. I love visiting there! 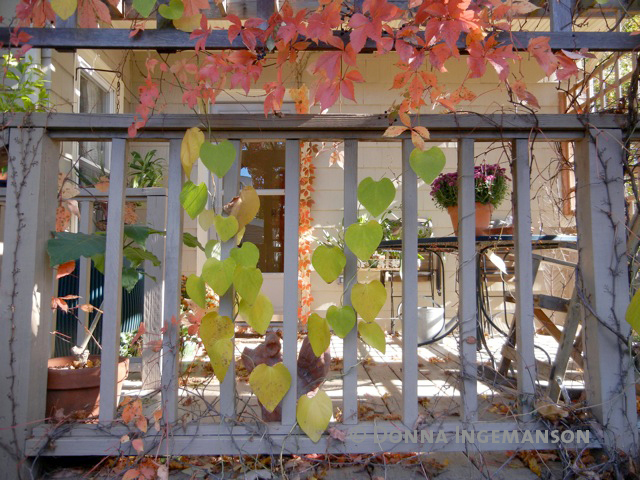 You are currently reading autumn inspirations at donna ingemanson studio.